Any electrical machine using alternating current (motors, transformers, …) involves two forms of energy: active energy and reactive energy. The active energy (kWh) is fully transformed into ‘useful’ power and heat. The reactive power (kVAR) is mainly used to power the magnetic circuits of electrical machines. oversizing and degradation of the quality of the electrical installation. It is therefore necessary to produce a quantity of reactive power as close to the load to prevent it from flowing to the power grid. This is what is called “reactive energy compensation.” The most common way is to place capacitor banks near the loads. 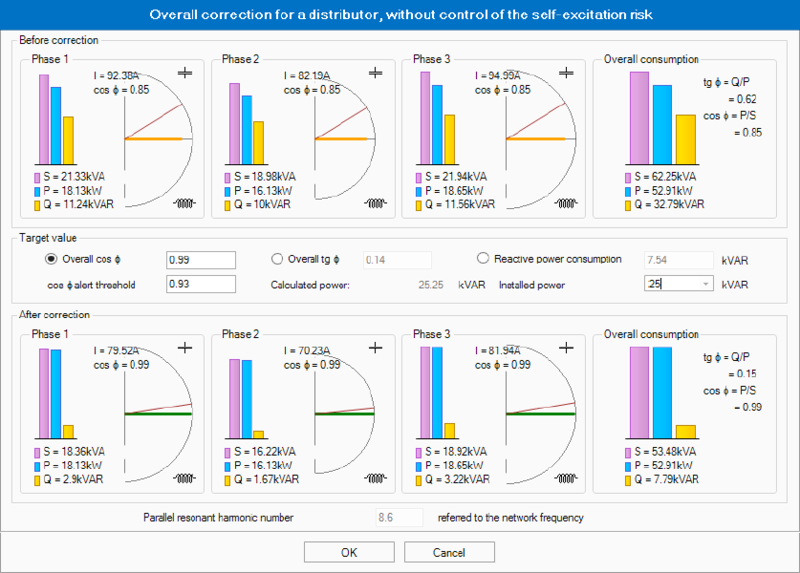 elec calc™ enables the sizing of capacitor banks through a specific window showing in real time the overall and phase power factors before and after compensation according to the rating of the capacitor banks installed. elec calc™ also calculates the harmonics rank that can lead to parallel resonance.